I'm flying home today from the Digital Library Federation Forum in Vancouver, where I presented an update on one of the major projects I've been working on since beginning my postdoctoral fellowship at Bryn Mawr College last summer. That project, the open access portal College Women: Documenting the History of Women in Higher Education | collegewomen.org, launched in May, the result of a year's work between Bryn Mawr and six partner institutions funded by a planning grant from the National Endowment for the Humanities (you can read the original grant narrative, here). 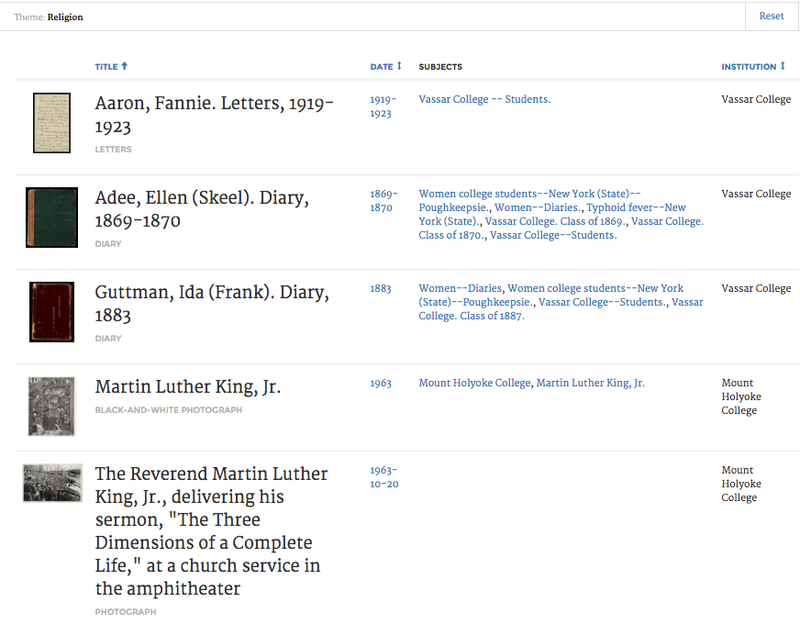 The site brings together -- for the first time online -- hundreds of digitized letters, diaries, scrapbooks and photographs of students who attended the northeast U.S. women’s colleges once (and often still) known as the Seven Sisters: Barnard, Bryn Mawr, Mount Holyoke, Smith, Vassar, Wellesley, and Radcliffe (now the Schlesinger Library, Radcliffe Institute for Advanced Study at Harvard University). Together, we have developed a pilot for subject-specific federated digital archives projects; our goal, most broadly, is to increase the visibility of women’s education histories, central to our missions as archives and teaching collections in historically women’s institutions. Digital collections development gave us the opportunity to connect our seven related but physically separate collections; our hope is to expand the portal significantly in the coming years. 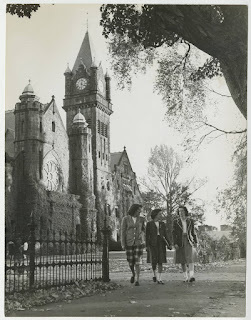 Barnard College Archives, via collegewomen.org. 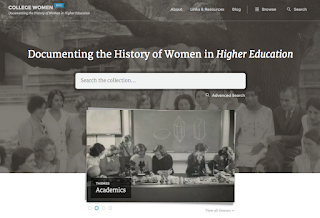 The idea for this project began with the concern that our seven institutions’ extensive collections of student materials were a largely underused set of documentation on the history of American women. Because our libraries and archives have similar histories, we knew we could aggregate similar materials -- for comparison and contrast. As a group, we agreed on themes that would shape what digital items we would contribute to the beta site. The themes were topical subjects that could better connect our materials (such as 'traditions' and 'academics') or keywords we saw as important to the history of discourse around women’s education, or topics we hope to document further. Themes can also be used in the site search so that our audiences can locate related results easily. One of those themes? Religion. Religion isn't a buzzword at the Digital Libraries Federation, which has been particularly attentive over the last few days to the intersection of race and gender with our digital work. It's still not much of a buzzword in digital history more generally (although I'm still hoping to learn more about the conversations that happened as part of the recent Catholic Research Resources Alliance event, Catholic Archives in the Digital Age: A Conference for Teachers and Archivists, and I continue to follow other digital religion conversations on RiAH with great interest). And, to be honest, religion isn't a major part of my work in the Bryn Mawr College Archives. But having researched and written about Catholic women's higher education for much of the last few years, and having taught courses on the history of women's higher education at the University of Chicago and now Bryn Mawr, I wonder how a project like College Women can expand to take account of the experiences of both students at religious institutions, whose archives may be even less well organized than those of the elite northeastern colleges, as well as religious students in nondenominational or secular colleges. So for the moment, inspired by the College Women site, how might we study religion at the Seven Sisters? "Religion" search results, collegewomen.org beta site. 1926, Bryn Mawr College Special Collections. Protestant sensibilities fueled the design of the other "Seven Sisters," particularly Vassar and Wellesley in the 1860s and 1870s, as Helen Lefkowitz Horowitz writes in Alma Mater: Design and Experience in the Women's Colleges (1985). This is a fact that routinely surprises some of my students at Bryn Mawr, unaccustomed to markers of religious life such as chapel on campus. 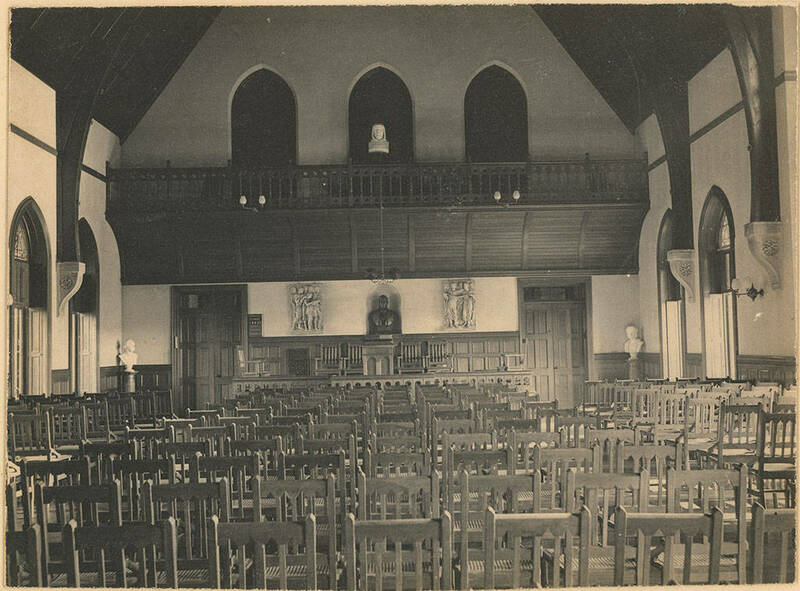 Bryn Mawr was founded by Quakers, but unlike its neighbors, Haverford and Swarthmore Colleges, the traces of that Quaker heritage are harder to spot. As Eric Pumroy argues in Founded by Friends (2007), "Bryn Mawr did indeed grow and prosper as an academic institution, as its founders wished, but not as a religious one, which they had also wished. The tension between academics and religion was settled in favor of the former by [the College's second president] M. Carey Thomas, a dynamic leader who saw that Bryn Mawr’s great mission was to prove that women were capable of the same intellectual achievements as men. If accomplishing this mission for women meant sacrificing a Quaker-based education, it was a sacrifice she was willing to make." 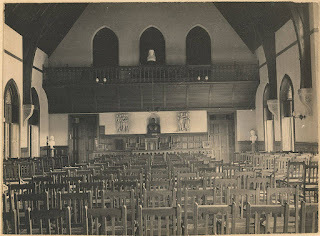 The Bryn Mawr chapel, for example, was not a grand, free-standing structure like Wellesley's beautiful Houghton Chapel; it was a large room in the central academic building, Taylor Hall. Its grandest occasion? Not regular prayer or worship, but the 1899 formal presentation of Thomas's portrait, painted by John Singer Sargent. The chapel no longer exists; the two-story space has been divided up into two floors of offices and storage space (that I accidentally stumbled into during my first summer on campus). 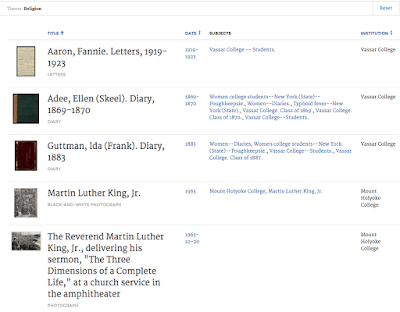 Archives and Special Collections, via collegewomen.org. Today, religious conversations at Bryn Mawr take place out of the College's diversity office, a host of student-led religious organizations, and a student-led Interfaith Council. In this context, one student in my women's education history course last semester was both intrigued and perplexed by a visit she made to Mount Holyoke College, and its Abbey Chapel building. How do we know if religion exists at college, she asked, if we can't see it in the built environment of our campuses? "Those who needed [the chapel] had it," she wrote for our public course blog, "and those who didn't want it could wander about unconcerned. These days, the chapel is open 8 am to 10 pm...7 days a week, and you can wander in and out as you like. That's what Bryn Mawr lacks -- the quiet presence of religion in the background, there for those who need it." I'm intrigued by these and other conversations about the place of religion on college campuses, as someone who has studied, taught, and written about American religion and American women's higher education separately for quite some time. 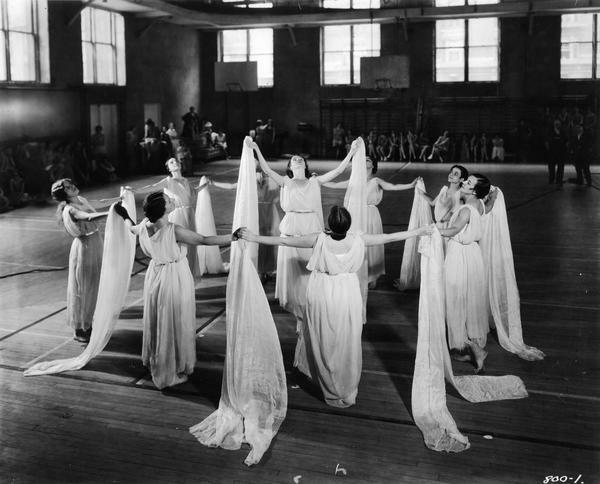 The digital project, collegewomen.org, and conversations with my students who participate in religious life on the 21st-century campus, show me new ways of continuing these lines of inquiry, in the College Archives and in our new virtual portal. With so much of the scholarship on religion and education as an object of study often focused on the K-12 experience, how might women's history find religion at college?